In the world of long distance backpacking, the act of triple crowning is seen as the highest achievement in the hiking community. It is often times not the initial intention of most hikers to become a Triple Crowner, but as the bug for thru hiking sets in, it becomes a natural progression for many. A hiker made this image displaying the markers for each trail and also the years they hiked them! 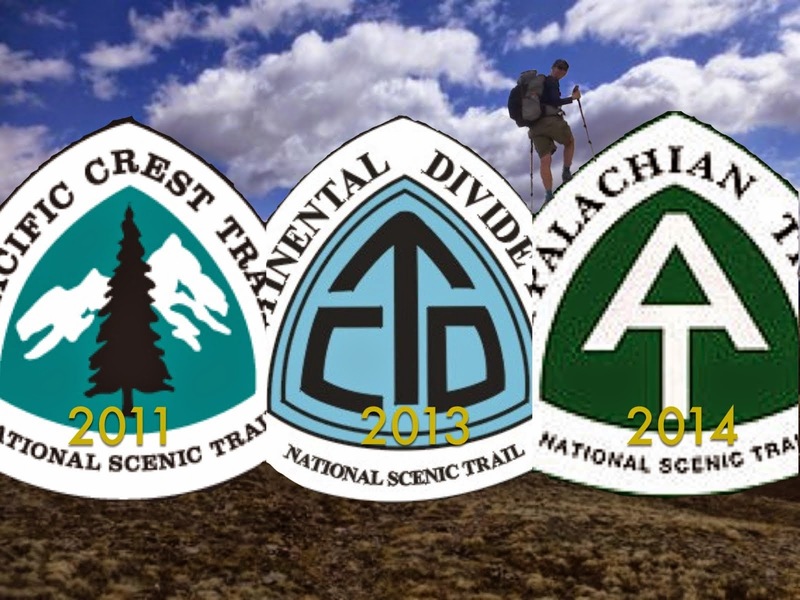 A Triple Crown in reference to long distance backpacking includes a thru hike of all three major National Scenic Trails in America, the Appalachian Trail (2,184 miles) the Pacific Crest Trail (2,654 miles) and the Continental Divide Trail (3,100 miles). Collectively the average mileage for a Triple Crowner is roughly 7,900 miles. It is no wonder that these unique hikers are far and few between in the hiking community. Walking a rugged stretch of mountains up America is the achievement of a life time for most, but these die hard thru hiking lovers do it three times over and with a revolving door of new terrain and unknown hurdles. They are truly the wizards of thru hiking knowledge! The idea of Triple Crowning for backpacking first came into being in the early 1970’s. A hiker named Eric Ryback thru hiked the AT in 1969, the PCT in 1970 and the CDT in 1972. In the decades since Rybsck’s completion, just shy of 200 other people have registered as Triple Crowners, though more may have thru hiked all three trails. To many folks, the idea of backpacking almost 8,000 miles is unfathomable, but it very possible. Even a hiker as young as 13 has completed a Triple Crown along with her father. Our very own Squarl who has been working at Mountain Crossings for many years is now a Triple Crowner! This entry was tagged appalachian Trail, backpacking, Continental Divide Trail, mountain crossings, Neel Gap, Pacific Crest Trail, thru hiking, Triple Crown. Bookmark the permalink. I had the privilege of meeting Squarl while in Pinedale, Wyoming this August. I enjoyed our conversation and he was very helpful. My wife and I had just came in from a short section of the CDT and he offered advice for an upcoming hike I had panned with some buddies in the Mt. Rogers / Damascus area of the AT. I’m glad Squarl made it to the finish line! Are there any posts of photos of his CDT trek? Thanks, Squarl for the tips. My friends and I enjoyed our stint on the AT.